However, as you can see, I’m back with a whole new look. And we are starting 2014 with a bang! . . . or a Touchdown as the case may be. 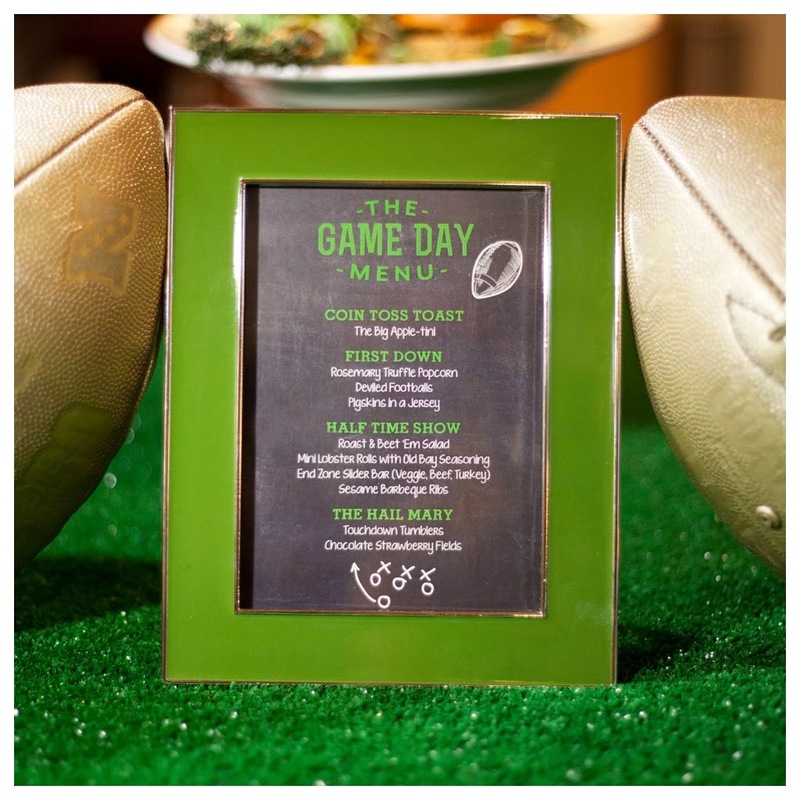 I teamed up with Hilary Pereira, of Hilary Pereira Event Design and Mermaids & Martinis, to plan an ultra stylish Super Bowl Bash. (Well, actually ours was a Playoff Bash.) 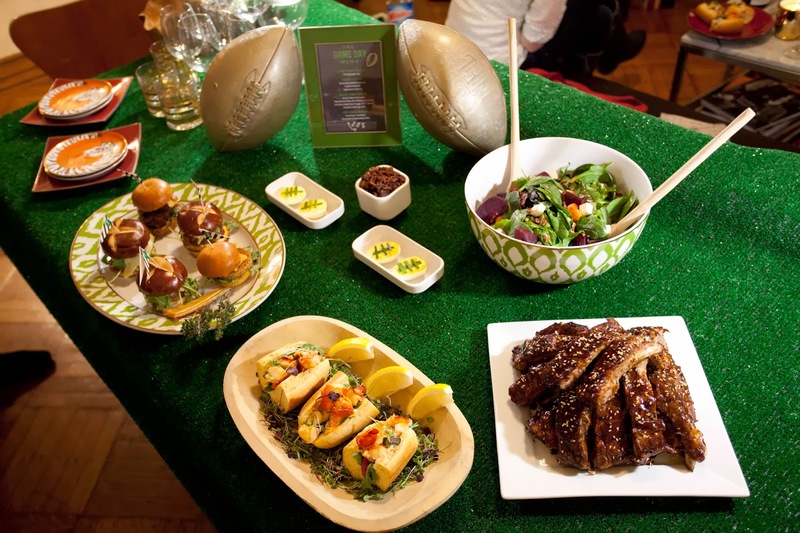 Hilary created the gorgeous party design you see here, while I created a menu of Tailgate Chic Super Bowl Snacks to accompany her beautiful décor. These recipes were made for entertaining, so they've all been created with timing in mind. In each case, you can either do most of the prep work in advance, whip them up in minutes, or the recipe makes use of slow cooking techniques, so you can have more time to prep and enjoy your party. Let’s not forget about drinks. Along with the recipes for the sliders, lobster rolls, and ribs you'll find a recommended wine pairing that is sure to please your guests. Each pairing is tried and tested. I selected three to four wines for these dishes that I thought might work, then tasted them all to see how they actually worked together in reality. To top it off, I got input from a group with palates at all ranges of experience; so, while all the final selections are mine, you can be sure that these wines will please wine newbies and wine geeks alike. And here is the biggest news yet!—C Wonder is featuring the recipes for the Mini Lobster Rolls and Sesame Barbeque Ribs on their Inside the C lifestyle blog. You'll also find Hilary’s decorating feature with tips and signature cocktails. First off, a big thanks to Inside the C.
Laura Sarvia Bott, of Bott and Co., created all of the fantastic designs for the signage and menus. and Mafe Martinez and her team, Ileana and Ruth, at Sites by Mufin created the new design for my site. And here is the biggest news yet—C Wonder is featuring the recipe for …. as well as Hilary’s décor and signature cocktails…On their Inside the C lifestyle blog. You can also find many of the table settings and other accessories that Hilary used in her design in their Home & Decor section. Thank you first to Inside the C.
Extra special thanks to Hilary and her team, Kat and Raphael. You can find Hilary at HilaryPereira.com. All of the beautiful photographs for these posts were taken by Daniel Movitz, DanielMovitz.com Laura Sarvia Bott of Bott and Co created the fantastic designs for the signage and menus. And my new site's design was created by Mafe Martinez and her team at Sites by Mufin.